Here's my attempt at baby Joe's knitted teddy bear, it's a freestyle pattern that I'm making up as I go along and I'm about to attempt to add arms. What's in your Creative Space today? Awesome colours and nice stitching. I can't knit a stitch, so I'm envious of anyone that can. Can't wait to see the finished project. Oh how cute! Nice bright colours! Good luck with the arms! I'm a hopeless knitter, but can crochet just fine. I envy your ability to both knit AND freestyle! How cute! Good luck with the arms. I like knitting. It's something about the click of the needles. Unfortunately I am not very good at it. Oh it's looking great, I love the colours. Goodluck but I'm sure you won't need it! It's cute already :) Good luck. I'm sure he'll love it. great start good luck with it. Oh wow, that is an impressive project! Good luck with it! Great colours. It's going to be lovely! I look forward to seeing more as he grows! It will be a very cute and colourful little bear! Looking forward to seeing it finished! Love the colour combos! 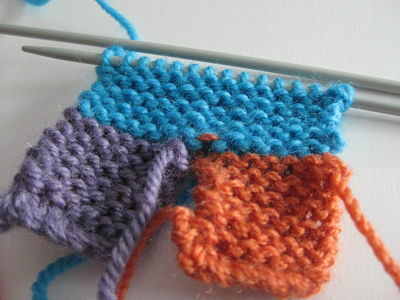 The colours look great together - am dead impressed at the idea of making hte pattern up as you go!